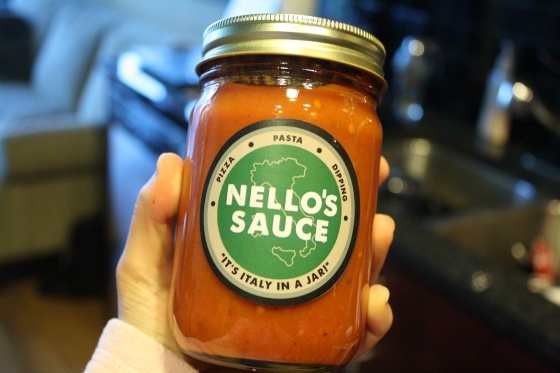 Recently, I had the good fortune of exchanging some tweets with the founder of Nello’s Sauce, a new North Carolina company specializing in authentic Italian pasta sauce. Lucky for me, the company sent me a jar of their sauce to try and I’ve been holding onto it until the urge to eat pasta struck. And struck me it did, last night. 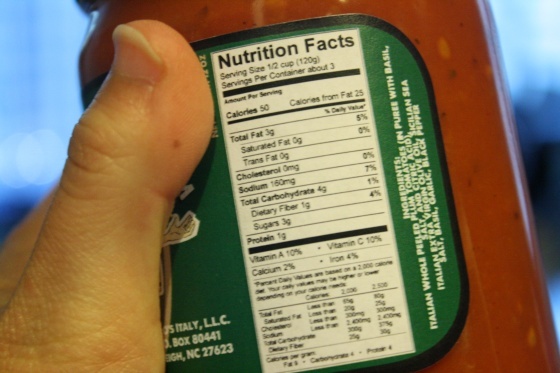 If you have ever taken a look at the back of pasta sauce jars, you’ve noticed that many of them are chock full of sugar. Yes, sugar in your tomato sauce. Seems a little unccessary if you’re using delcious tomatoes, right? Well, one quick look at the back of Nello’s and you’ll be pleasantly surprised to see that the sauce only contains 3 grams of sugar. For reference, Ragu has 6 grams in its traditional sauce and Prego has 7 grams in its marinara. The difference in sodium is shocking. 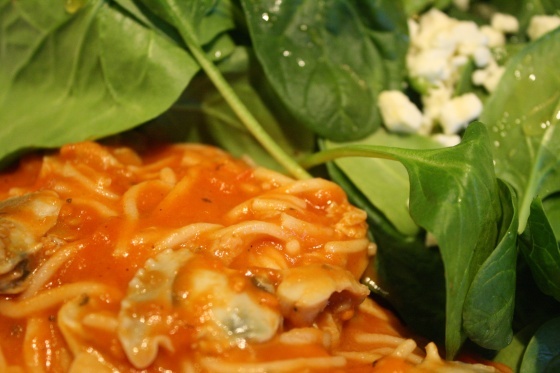 Ragu has 550 mg, Prego has 580 mg, while Nello’s has only 160 mg. What a difference! I knew exactly what I wanted to eat after seeing Jenna’s linguini and clams. Mine was a bit different, but I’m sure it was just as tasty. Boil spaghetti until thoroughly cooked (or al dente if you like a bit of a bite). Do not strain pasta, but remove from pot with a pasta spoon. 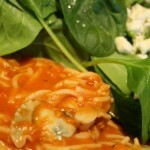 Mix in the pasta sauce and clams and toss until all ingredients are thoroughly incorporated. 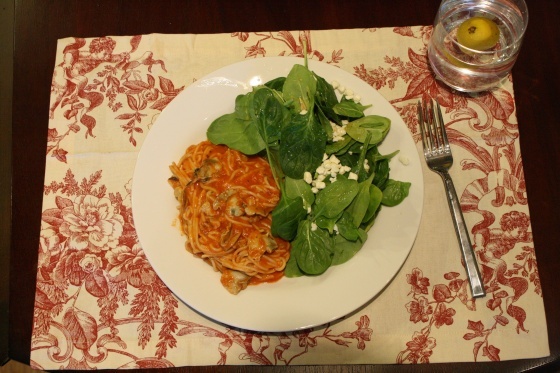 I ate my pasta with a spinach side salad, sprinkled with feta, and drizzled with lemon juice and honey. Nello’s Sauce was delicious! I hope one of our local grocers puts it on their shelves, but in the mean time, Nello’s Sauce can be bought on their website. I skipped working out in favor of doing three loads of laundry. I was a busy girl! All these evening plans have gotten in the way of my domestic responsibilities so something had to be sacraficed for the good of clean clothes. 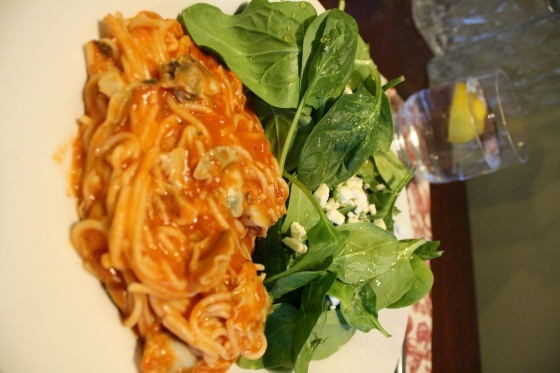 What’s your very favorite pasta dish? Do you check the pasta sauce labels?